Operating a golf course or other recreational facility has unique challenges. It requires a breadth of expertise, including: food service, retail, public relations, real estate, and customer service. 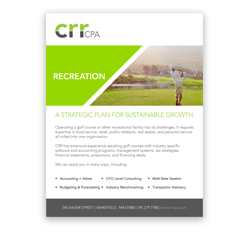 CRR has extensive experience assisting golf courses implement industry specific software and accounting programs and management systems. We can also advise you in tax strategies, financial statements, projections, and financing deals.